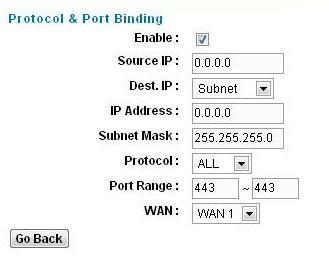 How to bind ports to one WAN port on D-Link DI-LB604 Balancing Router? This FAQ will demonstrate how to set up port binding for secure http on D-Link DI-LB604 WAN port 1. Step 1: Open a web browser and type the IP address of the DI-LB604 into the address bar (default is 192.168.0.1). Step 3: Click on the Tools tab at the top, then click on Misc on the lefthand side. Step 4: Click on the Set Protocol & Port Binding button at the bottom of the page.